The camp, approximately 15 miles (24.1 km) west of Delta, Utah, consisted of 19,800 acres (8,012.8 ha), with a 640 acres (259.0 ha) main living area. Most internees lived in the main living area, though some lived off-site as agricultural and industrial laborers. The approximately 9,000 internees and staff made Topaz into the fifth-largest city in Utah at the time. The extreme temperature fluctuations of the arid area combined with uninsulated barracks made conditions very uncomfortable, even after the belated installation of pot-bellied stoves. The camp housed two elementary schools and a high school, a library, and some recreational facilities. Camp life was documented in a newspaper, Topaz Times, and in the literary publication Trek. Internees worked inside and outside the camp, mostly in agricultural labor. Many internees became notable artists. In the winter of 1942–1943, a loyalty questionnaire asked prisoners if they would declare their loyalty to the United States of America and if they would be willing to enlist. The questions were divisive, and prisoners who were considered "disloyal" because of their answers on the loyalty questionnaire were sent to the Tule Lake Segregation Camp. One internee, James Wakasa, was shot and killed for being too close to the camp's fence. Topaz prisoners held a large funeral and stopped working until administrators relaxed security. In 1983, Jane Beckworth founded the Topaz Museum Board, and in 2014, a museum in Delta showcased artworks created at Topaz. After the museum was remodeled in 2017, it focused on the historical aspects of Topaz. The site became a U.S. National Historic Landmark in 2007. Topaz was originally known as the Central Utah Relocation Authority, and then the Abraham Relocation Authority, but the names were too long for post office regulations. The final name, Topaz, came from Topaz Mountain which overlooks the camp from 9 miles (14.5 km) away. Topaz was the primary internment site in the state of Utah. A smaller camp existed briefly a few miles north of Moab, which was used to isolate a few men considered to be troublemakers prior to their being sent to Leupp, Arizona. A site at Antelope Springs, in the mountains west of Topaz, was used as a recreation area by the residents and staff of Topaz. Most internees came from the San Francisco Bay Area, which has a warm-summer Mediterranean climate, with moist mild winters and dry summers. Topaz had an extreme climate, located at 4,580 feet (1,400 m) above sea level in the Sevier Desert. A "Midlatitude Desert" under the Köppen classification, temperatures could vary greatly throughout the day. The area experienced powerful winds and dust storms. One such storm caused structural damage to 75 buildings in 1944. Temperatures could reach below freezing from mid-September until the end of May. The average temperature in January was 26 °F (−3 °C). Spring rains turned the clay soil to mud, which bred mosquitoes. Summers were hot, with occasional thunderstorms and temperatures that could exceed 100 °F (38 °C). In 1942, the first snowfall occurred on October 13, before camp construction was fully complete. The camp was designed to be self-sufficient, and the majority of land within the camp was devoted to farming. 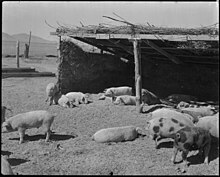 Topaz inmates raised cattle, pigs, and chickens in addition to feed crops and vegetables. The vegetables were high-quality and won awards at the Millard County Fair. Due to harsh weather, poor soil, and short growing conditions, the camp was not able to supply all of its animal feed. 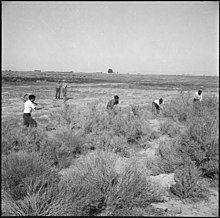 Internees clear land for agricultural use. Some internees were permitted to leave the camp to find employment. In 1942, internees were able to get permission to leave the camp for employment in nearby Delta, where they filled labor shortages caused by the draft, mostly in agricultural labor. :28–29 In 1943 over 500 internees obtained seasonal agricultural work outside the camp, with another 130 working in domestic and industrial jobs. :30 Polling showed that a majority of Utahns supported this policy. One teacher at the camp art school, Chiura Obata, was allowed to leave Topaz to run classes at nearby universities and churches. Internees were also sometimes permitted to leave the camp for recreation. A former Civilian Conservation Corps camp at Antelope Springs, in mountains 90 miles (144.8 km) to the west, was taken over as a recreation area for internees and camp staff, and two buildings from Antelope Springs were brought to the central area to be used as Buddhist and Christian churches. During a rock hunting expedition in the Drum Mountains, 16 miles (26 km) west of Topaz, Akio Uhihera and Yoshio Nishimoto discovered and excavated a 1,164 pounds (528 kg) rare iron meteorite, which the Smithsonian Institution acquired. Topaz internees Fred Korematsu and Mitsue Endo challenged their internment in court. Korematsu's case was heard and rejected at the US Supreme Court (Korematsu v. United States), the largest case to challenge internment, while Endo's case was upheld. After Topaz was closed, the land was sold and most of the buildings were auctioned off, disassembled, and removed from the site. Even the water pipes and utility poles were sold. 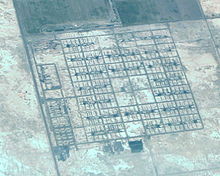 Numerous foundations, concrete-lined excavations and other ground-level features can be seen at the various sites, but few buildings remain, and natural vegetation has taken over most of the abandoned areas. In 1976, the Japanese American Citizens League placed a monument on the northwestern corner of the central area. On March 29, 2007, United States Secretary of the Interior Dirk Kempthorne designated "Central Utah Relocation Center Site" a National Historic Landmark. In 1982, Delta High School teacher Jane Beckwith and her journalism students began to study Topaz. She spearheaded the creation of the Topaz Museum Board in 1983, which oversaw the Topaz Museum, which initially shared space with the Great Basin Museum. Funding from the Japanese-American Confinement Sites organization enabled the Topaz Board to construct its own museum building in 2013.. In 2015, the museum formally opened with an exhibition of art created at Topaz, entitled "When Words Weren't Enough: Works on Paper from Topaz, 1942-1945." The museum closed for remodeling in November 2016, and reopened in 2017 as a traditional museum focused on the history of Topaz. By 2017, the Topaz Museum and Board had purchased 634 of the 640 acres of the original internment site. Richard Aoki (1938–2009), an American civil rights activist. George Matsusburo Hibi (1886–1947), an Issei artist. Yuji Ichioka (1936–2002), an American historian who coined the term "Asian American". Miyoko Ito (1918–1983), an artist known for her watercolor and abstract oil paintings and prints. Fred Korematsu (1919–2005), who challenged the constitutionality of Executive Order 9066 in Korematsu v. United States. Robert Murase (1938–2005), a world-renowned landscape architect. Frank H. Ogawa (1917–1994), the first Japanese American to serve on the Oakland City Council. Mary Yamashiro Otani (1923–2005), a community activist. Kay Sekimachi (born 1926), an American fiber artist. Toyo Suyemoto (1916–2003), an American poet, memoirist, and librarian. Goro Suzuki (1917–1979), an Oakland-born entertainer known widely under his stage name, Jack Soo, star of the original stage and movie productions of Flower Drum Song and remembered for his role as Detective Nick Yemana on the 1970s sitcom Barney Miller. Suzuki was a favorite performer at Topaz gatherings. Dave Tatsuno (1913–2006), a Japanese American businessman who documented life in an American concentration camp on film. Kazue Togasaki (1897–1992), one of the first two women of Japanese ancestry to earn a medical degree in the United States. Also interned at Tule Lake and Manzanar. Yoshiko Uchida (1921–1992), a Japanese American writer, most notable for her books, Desert Exile: The Uprooting of a Japanese American Family and Picture Bride. Thomas Yamamoto (1917–2004), an American artist. Using a smuggled camera, Dave Tatsuno shot film of Topaz. The documentary Topaz uses film he shot from 1943 to 1945. This film was an inductee of the 1997 National Film Registry list, with the added distinction of being the second "home movie" to be included on the Registry and the only color footage of camp life. Topaz War Relocation Center is the setting for the 2007 film American Pastime, a dramatization based on actual events, which tells the story of Nikkei baseball in the camps. A portion of the camp was duplicated for location shooting in Utah's Skull Valley, approximately 40 miles (64.4 km) west of Salt Lake City and 75 miles (120.7 km) north of the actual Topaz site. The film used some of Tatsuno's historical footage. In addition to Tatsuno's Topaz, Ken Verdoia made a 1987 documentary, also entitled Topaz. Yoshiko Uchida's young adult novel Journey to Topaz recounts the story of Yuki, a young Japanese American girl, whose world is disrupted when, shortly after Pearl Harbor, she and her family must leave their comfortable home in the Berkeley, California suburbs for the dusty barracks of Topaz. The book is largely based on Uchida's personal experiences: she and her family were interned at Topaz for three years. Julie Otsuka's novel When the Emperor was Divine tells the story of a family forced to relocate from Berkeley to Topaz in September 1942. Each of the novel's five chapters is told from the point of view of a different character. Critics praised the book's "precise but poetic evocation of the ordinary" and "ability to empathize." Over 45 colleges and universities included it in their required reading for freshmen. Much of the art made by detainees at the camp depicted life there, and survives. Drawings and woodcuts by Chiura Obata and Matsusaburō (George) Hibi are among the most prominent. Some of it is collected in The Art of Gaman: Arts and Crafts from the Japanese American Internment Camps, 1942–1946 by Delphine Hirasuna, and has been exhibited in Topaz and at the Wight Art Gallery. In 2018, the Utah Museum of Fine Arts exhibited many Chiura Obata's works, including some made at Topaz. ^ "Central Utah Relocation Center (historical)". Geographic Names Information System. United States Geological Survey. December 31, 1979. Retrieved November 7, 2018. ^ National Park Service (November 2, 2013). "National Register Information System – (#74001934)". National Register of Historic Places. National Park Service. Retrieved November 7, 2018. ^ "Central Utah Relocation Center (Topaz) Site". National Historic Landmark summary listing. National Park Service. Archived from the original on October 11, 2012. Retrieved December 6, 2008. ^ a b Farrell, Mary M.; Lord, Florence B.; Lord, Richard W.; Burton, Jeffery F. (2002). Confinement and Ethnicity: An Overview of World War II Japanese American Relocation Sites. University of Washington Press. p. 259. ISBN 978-0-295-98156-7. Archived from the original on February 8, 2018. ^ a b c d e f g h i j k Huefner, Michael. "Densho Encyclopedia: Topaz". encyclopedia.densho.org. Densho. Archived from the original on July 7, 2016. Retrieved July 21, 2016. ^ "The Manzanar Controversy". Public Broadcasting System. Archived from the original on June 5, 2012. Retrieved July 18, 2007. ^ Daniels, Roger (May 2002). "Incarceration of the Japanese Americans: A Sixty-Year Perspective". The History Teacher. 35 (3): 4–6. doi:10.2307/3054440. JSTOR 3054440. Archived from the original on June 9, 2007. Retrieved July 18, 2007. ^ Ito, Robert (September 15, 1998). "Concentration Camp Or Summer Camp?". Mother Jones. Archived from the original on June 14, 2007. Retrieved July 19, 2007. ^ Manzanar Committee (1998). Reflections: Three Self-Guided Tours Of Manzanar. Manzanar Committee. iii–iv. ISBN 978-0-15-669261-8. ^ "CLPEF Resolution Regarding Terminology". Civil Liberties Public Education Fund. 1996. Archived from the original on July 3, 2007. Retrieved July 20, 2007. ^ a b c d e f g h i j k l m n o p q r Arrington, Leonard J. (1997). The Price of Prejudice: the Japanese-American Relocation Center in Utah During WWII (2nd ed.). Delta, Utah: Topaz Museum. Archived from the original on September 10, 2016. Retrieved July 19, 2016. ^ "Relocation and Incarceration of Japanese Americans During World War II". University of California – Japanese American Relocation Digital Archives. Archived from the original on April 26, 2014. Retrieved April 25, 2014. ^ Hansen, Arthur. "Moab/Leupp Isolation Centers (detention facility)". Densho. Archived from the original on February 6, 2018. Retrieved February 5, 2018. ^ "Antelope Springs (detention facility)". Densho Encyclopedia. Archived from the original on August 12, 2014. Retrieved August 11, 2014. ^ "Climate of San Francisco". Golden Gate Weather Services. 2009. Retrieved September 19, 2017. ^ a b Lillquist, Karl (September 2007). Imprisoned in the Desert: The Geography of WWII-Era Japanese America Relocation Centers in the Western United States. Chapter 7: Central Washington University. p. 274. Archived from the original on August 2, 2016. Retrieved July 21, 2016. ^ Beckwith, Jane. "Topaz Relocation Center". Utah History Encyclopedia. Archived from the original on March 5, 2016. Retrieved July 21, 2016. ^ "Norman Hirose describes his family's living quarters in Topaz". Densho Encyclopedia. Densho Encyclopedia. Archived from the original on August 1, 2016. Retrieved July 21, 2016. ^ Lillquist, Karl (September 2007). Imprisoned in the Desert: The Geography of WWII-Era Japanese America Relocation Centers in the Western United States. Chapter 7: Central Washington University. p. 298. Archived from the original on August 2, 2016. Retrieved July 21, 2016. ^ Hirai, Tomo. "Topaz High School class reunites for third last hurrah". www.nichibei.org. Archived from the original on February 7, 2018. Retrieved February 5, 2018. ^ Lillquist, Karl (September 2007). Imprisoned in the Desert: The Geography of WWII-Era Japanese America Relocation Centers in the Western United States. Chapter 7: Central Washington University. p. 303. Archived from the original on August 2, 2016. Retrieved July 21, 2016. ^ Lillquist, Karl (September 2007). Imprisoned in the Desert: The Geography of WWII-Era Japanese America Relocation Centers in the Western United States. Chapter 7: Central Washington University. p. 284. Archived from the original on August 2, 2016. Retrieved July 21, 2016. ^ a b c d Schultz, Charles M (September – October 2015). "Paper Planes: Art from Japanese American Internment Camps". Art in Print. 5 (3). ^ Stokey, Kathleen (December 20, 1944). "Meteor Found in Utah: Japs Find Half-Ton Specimen Near Topaz". Deseret News. Retrieved August 29, 2018 – via Google News. ^ a b Lyon, Cherstin M. "Loyalty Questionnaire". densho.com. Densho Encyclopedia. Archived from the original on February 9, 2018. Retrieved February 8, 2018. ^ Niiya, Brian. "Ex parte Endo". Densho Encyclopedia. Densho Encyclopedia. Archived from the original on August 22, 2016. Retrieved July 21, 2016. ^ Lee, Toni and, Wolfe, Shane (April 4, 2007). "Interior Secretary Kempthorne Designates 12 National Historic Landmarks in 10 States" (Press release). National Park Service. Archived from the original on October 27, 2007. Retrieved June 27, 2008. ^ a b Bancroft, Kaitlyn (July 6, 2017). "Newly restored Topaz Museum clears the dust away from Utah's forgotten past". DeseretNews.com. Archived from the original on February 8, 2018. Retrieved February 7, 2018. ^ "Asian / Pacific American Archives Survey: Karl Ichiro Akiya Papers". Archived from the original on June 20, 2010. Retrieved May 29, 2009. ^ Niiya, Brian. "Yuji Ichioka". Densho.org. Densho Encyclopedia. Archived from the original on December 6, 2017. Retrieved June 21, 2018. ^ Wakida, Patricia. "Miyoko Ito". Densho.org. Densho Encyclopedia. Archived from the original on October 7, 2017. Retrieved June 21, 2018. ^ Imai, Shiho. "Fred Korematsu". Densho.org. Densho Encyclopedia. Archived from the original on October 23, 2017. Retrieved June 21, 2018. ^ Matsumoto, Nancy. "Toshio Mori". Densho.org. Densho Encyclopedia. Archived from the original on February 15, 2017. Retrieved June 21, 2018. ^ Wakida, Patricia. "Robert Murase". Densho.org. Densho Encyclopedia. Archived from the original on September 9, 2016. Retrieved June 21, 2018. ^ "U.S. National Archives: Japanese-American Internee Data File for Frank Ogawa". Archived from the original on June 13, 2012. Retrieved October 30, 2011. ^ Wakida, Patricia. "Kay Sekimachi". Densho.org. Densho Encyclopedia. Archived from the original on May 22, 2016. Retrieved June 21, 2018. ^ Streamas, John. "Tomo Suyemoto". Densho.org. Densho Encyclopedia. Archived from the original on January 21, 2018. Retrieved June 21, 2018. ^ Niiya, Brian. "Jack Soo". Densho.org. Densho Encyclopedia. Archived from the original on September 5, 2015. Retrieved June 21, 2018. ^ a b Fox, Margalit (February 13, 2006). "Dave Tatsuno, 92, Whose Home Movies Captured History, Dies". The New York Times. Retrieved June 27, 2008. ^ Beggs, Marjorie (August 30, 2015). "Pioneering Japanese-American Doctor Remembers Quake, World War II, Her Neighborhoods | Hoodline". Hoodline. Archived from the original on October 11, 2017. Retrieved June 21, 2018. ^ Uchida, Yoshiko (1982). Desert Exile: The Uprooting of a Japanese American Family. University of Washington Press. ISBN 978-0-295-96190-3. ^ Uchida, Yoshiko (1987). Picture Bride. Simon & Schuster, Inc. ISBN 978-0-671-66874-7. 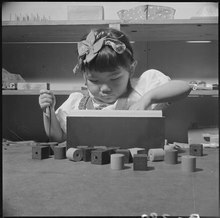 ^ "National Archives: Thomas Yamamoto". Archived from the original on March 12, 2012. Retrieved December 22, 2010. ^ "Complete National Film Registry Listing". Archived from the original on March 5, 2016. Retrieved September 12, 2017. ^ Mori, Darryl (August 24, 2007). "Baseball in the Camps: Behind the Scenes of "American Pastime"". Discover Nikkei. Discover Nikkei. Archived from the original on February 8, 2018. Retrieved February 7, 2018. ^ Wakida, Patricia. "American Pastime (film)". Densho Encyclopedia. Archived from the original on February 8, 2018. Retrieved February 7, 2018. ^ Niiya, Brian (1987). "Topaz (film)". Densho. Archived from the original on August 1, 2016. ^ Niiya, Brian. "Journey to Topaz: A Story of Japanese-American Evacuation (book)". Densho Encyclopedia. Archived from the original on February 8, 2018. Retrieved February 7, 2018. ^ Niiya, Brian. "When the Emperor Was Divine (book)". Densho Encyclopedia. Archived from the original on February 8, 2018. Retrieved February 7, 2018. ^ Otsuka, Julie. "ABOUT". www.julieotsuka.com. Archived from the original on February 8, 2018. Retrieved February 7, 2018. ^ "Chiura Obata: An American Modern". umfa.utah.edu. Retrieved August 2, 2018. Uchida, Yoshiko (1971). Journey to Topaz. New York: Scribner's Sons. ISBN 9780684124971. Uchida, Yoshiko (1978). Journey Home. New York: Atheneum. ISBN 9780689501265. Huefner, Michael. "Densho Encyclopedia: Topaz". encyclopedia.densho.org. Densho. Retrieved July 21, 2016. Wakida, Patricia. "Densho Encyclopedia: Topaz Times (newspaper)". encyclopedia.densho.org. Densho. Retrieved July 12, 2016. Wikimedia Commons has media related to Topaz War Relocation Center.